Pauley Pavilion did its best Superdome impression Monday night during the first-ever L.A. Tennis Challenge. As Novak Djokovic and Pete Sampras teamed up against the Bryan brothers for a doubles exhibition match — one guest-judged by actor Rainn Wilson — the main lights cut out and forced an early tiebreaker set. 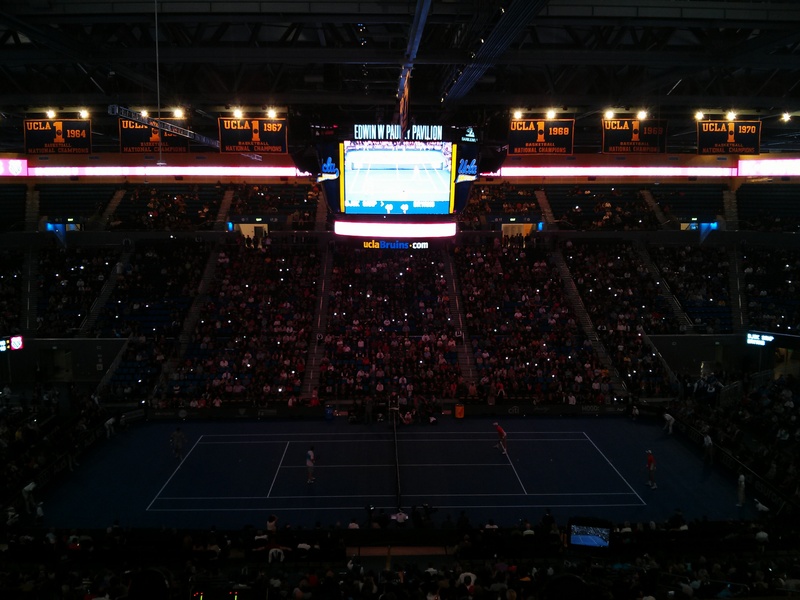 It would take 15 minutes for the lights to return, so Wilson asked the crowd of 8,500 to use their phones to help out. This entry was posted in Uncategorized and tagged Bob Bryan, L.A. Tennis Challenge, Mike Bryan, Novak Djokovic, Pauley Pavilion, Pete Sampras by Jack Wang. Bookmark the permalink. wow I had no idea they could play tennis matches inside Pauley. That’s kind of awesome.